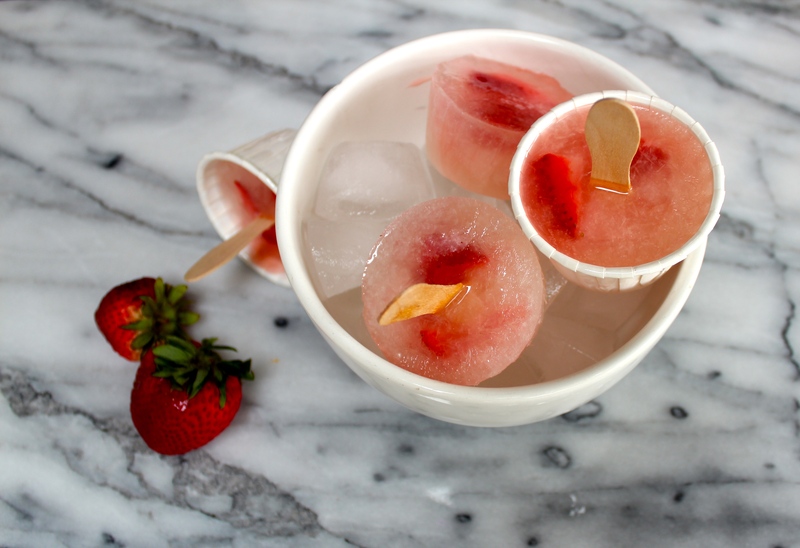 Happiness Project Recipe #59: Strawberry-Lemonade Toddler Ice Pops! Oh my sweetness, my friends! Spring is officially upon us! Ehr…those of us in California, that is. Which means warmer weather. For better or for worse, depending on if you actually like warmer weather. And strawberries. Beautiful, lush, ripe strawberries. Ultimate Mommy happiness. And did I forget to mention prime Popsicle-making season? It tis! Especially for Toddlers. Okay, and maybe for those of us adults who are also kids-at-heart, too. I promise I won’t tell any of the “other” adults. Anyhow, back to this glorious, long anticipated Popsicle-making season. I’ve been wanting to create my own Daughter appeasing fruit popsicles for a few months now. But had to wait for the perfect strawberries. And well, here they are! Strawberry-Lemonade Ice Pops! With the lovely tang of sweet lemonade and juicy bits of chilled strawberries. The best of everything a picky Toddler and busy Mom could ever want. Point in case? Even though it only took me maybe 45 minutes (from start to finish) for these pops to become the perfect frozen consistency, my Daughter consumed 3 of these in less than 10 minutes. I kid you not. Less than TEN minutes. And then ran back up to the fridge, while enthusiastically hopping up and down, saying, “More!” Yes, I did said, “No.” 3 of these is quite enough for one mere Toddler sitting. I swear I’m not a mean Mom. I swear! Ready for a taste? Here ya go! Arrange up to 12 baking cups onto a small baking sheet. In each cup, pour in enough lemonade to fill the cup all the way up to the top edge. Place the lemonade filled cups into the freezer for about 20-25 minutes. While the lemonade cups are firming up, wash, slice & dice the strawberries until you have 2 to 3 strawberry pieces per lemonade cup. Before adding in the strawberry pieces, check that the lemonade cups have firmed up enough to be slightly harder than a slushy (consistency). 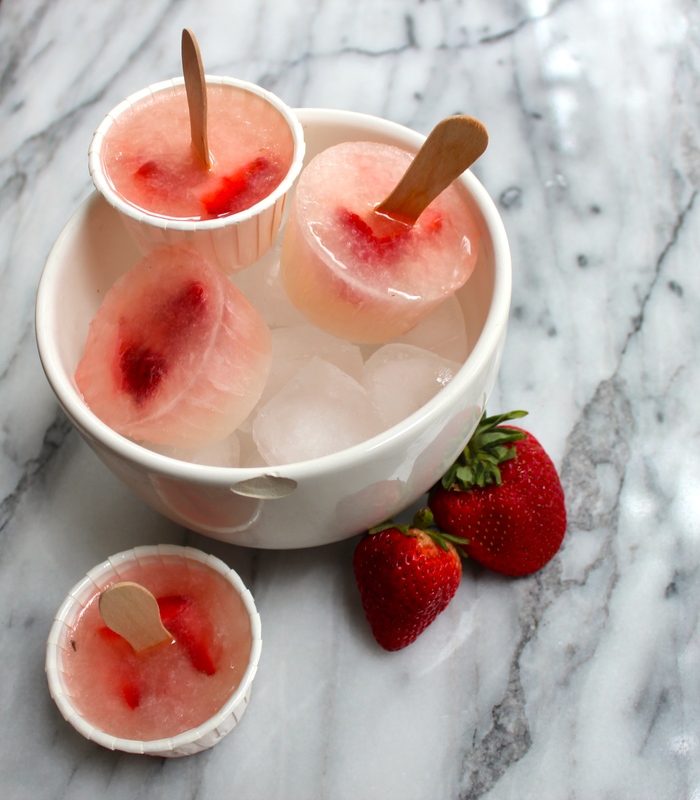 Gently push 2 to 3 strawberry pieces into each cup before placing the pops back into the freezer. Again with the freezer, I know. Once the pops have been in the freezer for another 10 minutes, remove them from the freezer and push in each popsicle stick, into the direct center of each cup, from top to bottom. Freeze again until fully frozen. Once you’re ready to serve them up to all of those hungry Toddler tummies, simply peel away each baking cup and hand em over. Just promise me that you’ll save at least 1 for yourself, okay? « Happiness Project Recipe#58: Hawaiian Roll Tuna Cheese Sandwich! My kids LOVE popsicles, they will go crazy for these! Beautiful pictures :). We actually have a few jugs of lemonade left over from the birthday party so I think I’ll make these over the weekend. These Strawberry-Lemonade ice pops look so yummy! My daughter and I would have so much fun making and eating these! I want to just make these for my kids… I don’t even have toddlers anymore.